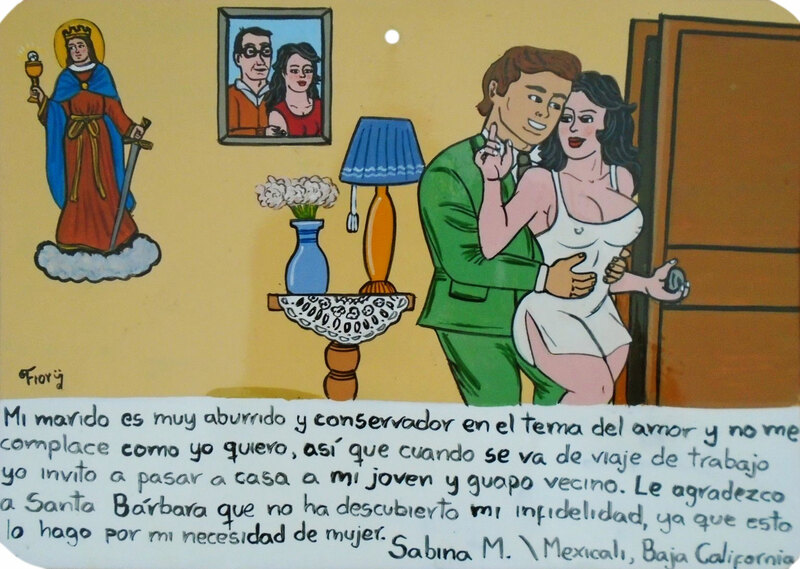 I thank Saint Barbara for the miracle of my husband (? ), our love and the beautiful house he built for me with his own hands. At the day of my wedding my fiancé changed his mind and didn’t come to the church. Furious with rage and pain, I ran to the cape and threw myself into the sea to kill myself. 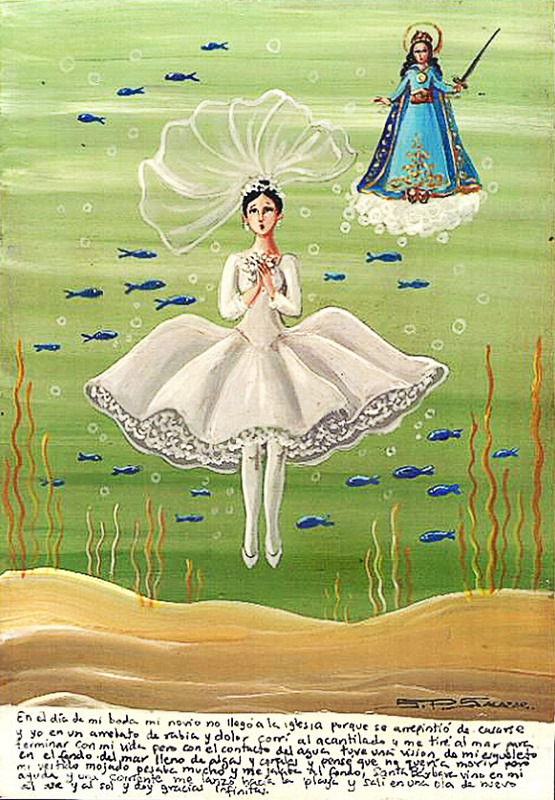 But after falling into the water I imagined my skeleton in the wedding dress lying at the bottom of the sea and surrounded by corrals and seaweed. I realized I didn’t want to die. But my dress got wet and heavy and dragged me down. Saint Barbara came to help me. I was taken by a current and brought up to the shore. A wave threw me back to the air and to the sun. I’m infinitely grateful for that. It was a very hot day so my daughters went to do their homework under the big tree on the hill. They didn’t know there was a wasp honeycomb on a lower branch. 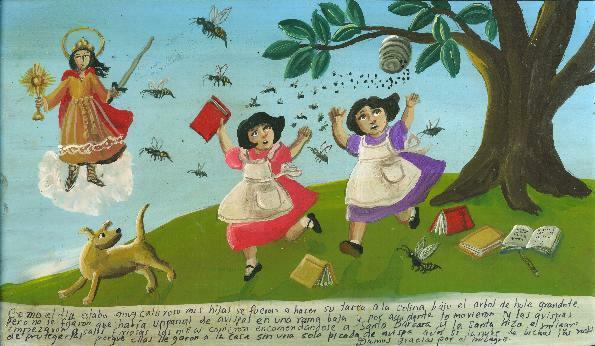 When they touched it by accident, the wasp came out very furious. The girls entrusted themselves to Saint Barbara, and the saint protected them. They ran to the house without even one sting. We give thanks for this miracle. Being sailor’s daughter and grand-daughter, my daughter Aurora was able to hear the mermaid songs. 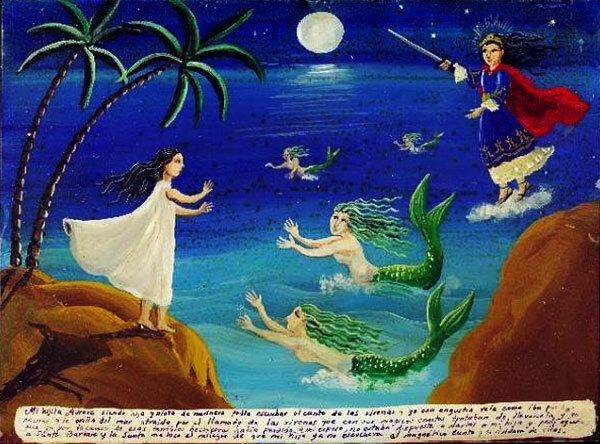 I was worried seeing her running every night to the edge of the cliff captivated by the mermaids’ voices. They called her to go with them, and I ran to hold her because this singing seemed to hypnotize her. 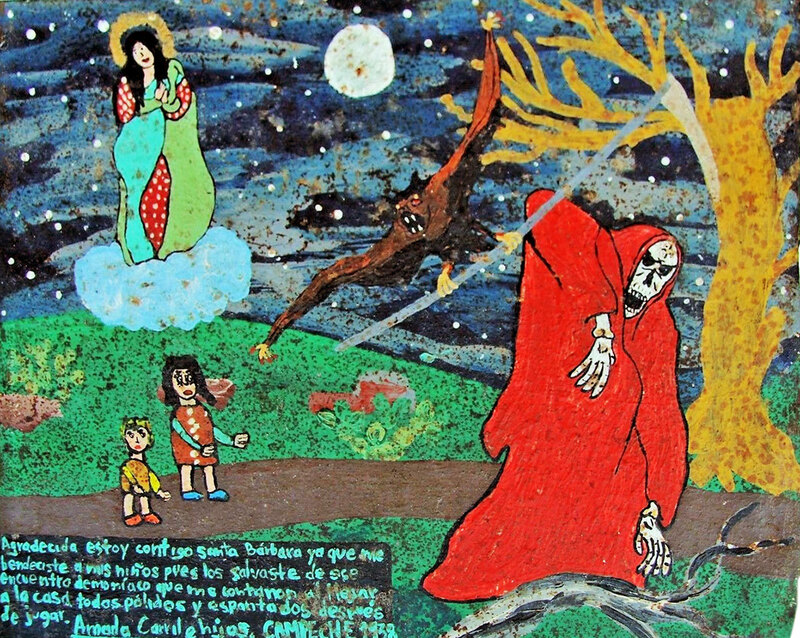 I prayed Saint Barbara for help, and she worked a miracle. Now my daughter doesn’t hear their songs. She like me hears just a distant echo. My husband is very boring and conservative when it comes to love. He doesn’t satisfy me as I want. So when he goes in business trips I invite a young handsome neighbor to our house. I thank Saint Barbara for my husband hasn’t found out about my infidelity since I only do this because of my woman needs. The father and the grandfather of my daughter Aurora were sailors. That’s why she was able to hear the mermaid songs. 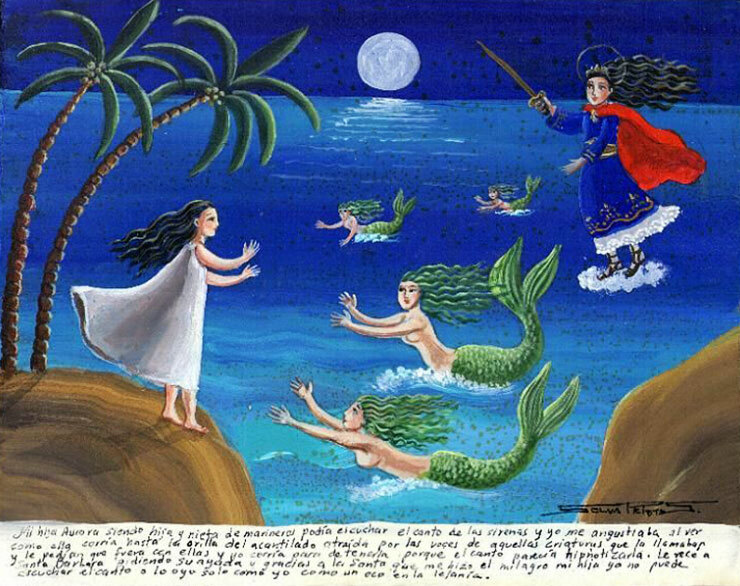 I was worried seeing her walking every night to the sea captivated by the mermaids’ voices and staying on the edge of the cliff enchanted by their singing. I lost my husband because of these enchanting songs. 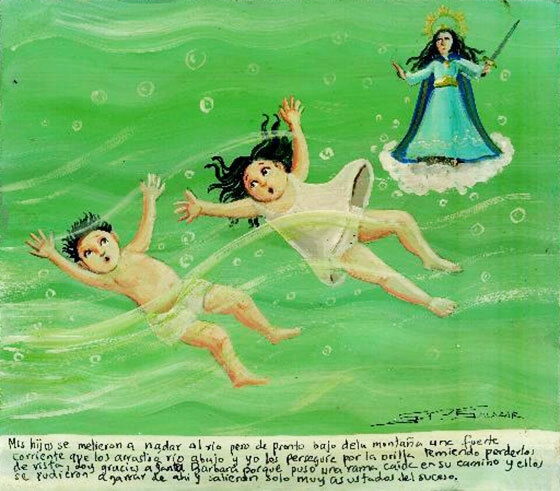 I didn’t want to lose my daughter also so prayed Saint Barbara for help, and she worked a miracle. Now my daughter doesn’t hear their singing and doesn’t go to the mermaids. My husband was a football fan, He used to come home and turn on the TV first thing to wash his games. He didn’t pay me any attention and never had time for the intimacy. I was so desperate I even thought about asking for a divorce. I fervently prayed Saint Barbara, and title by little my husband’s sport fever went down. Now he’s a more loving and, above all, fulfilling husband. My children went to swim to the river. But suddenly a strong current under the mountain dragged them down to the river. I ran along the river frightened that I might lose them out of sight. I thank Saint Barbara because she put a fallen branch on their way. They managed to grab on it and then get out just very frightened of what happened. I always enjoyed the speed and strong emotions. But then I got in a terrible crash on my motorcycle. I suffered multiple fractures and spent several weeks in the hospital. 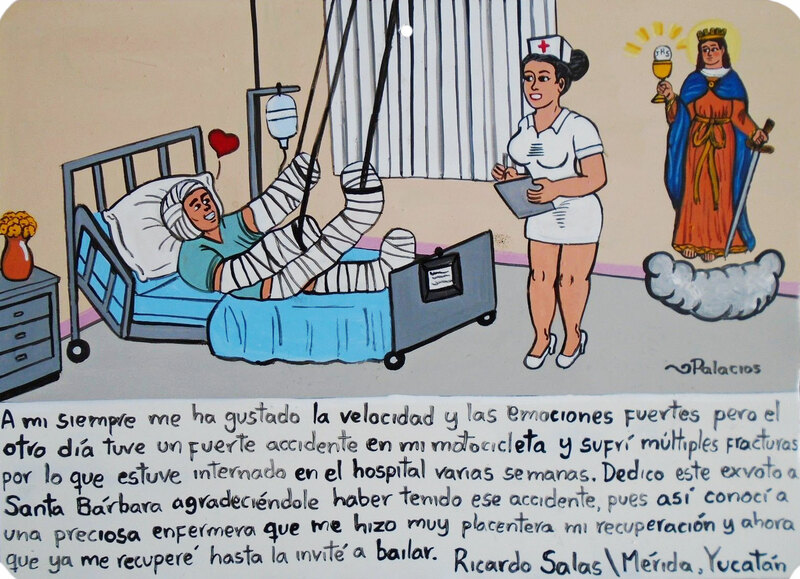 I dedicate this retablo to Saint Barbara thanking her for that crash because that way I met a gorgeous nurse who made my recovery very pleasant. Now, when I’m recovered I’ve even invited her to go dancing. My husband Edilberto bet me one thousand pesos that I will never learn to drive. 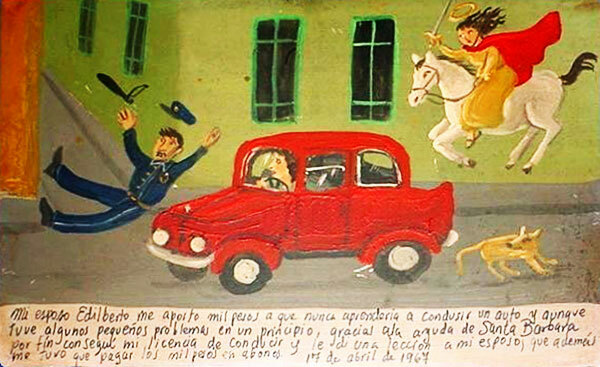 Although I had to face some troubles at the beginning, thanks to Saint Barbara I got my driving license. I teach my husband a lesson and got my thousand pesos. 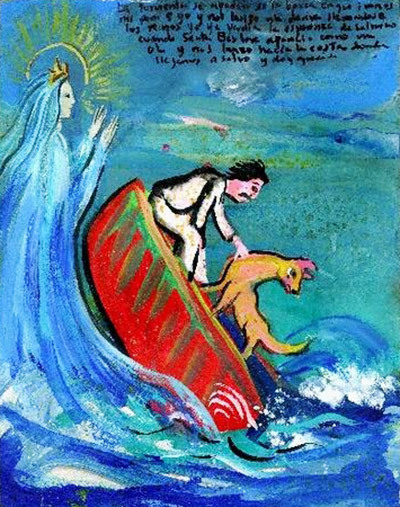 The boat with me and my dog was carried away by the storm. I lost my oars, so we were left drifting. 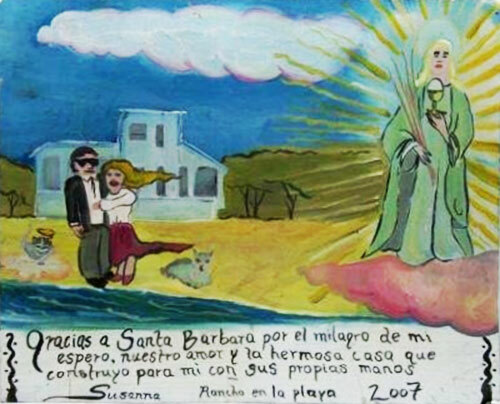 I almost lost the hope of surviving when Saint Barbara appeared as a giant wave. She threw us to the shore, and we arrived safely. I thank for that. I received a call from a local newspaper. They asked me to bring my texts, and I got very excited. 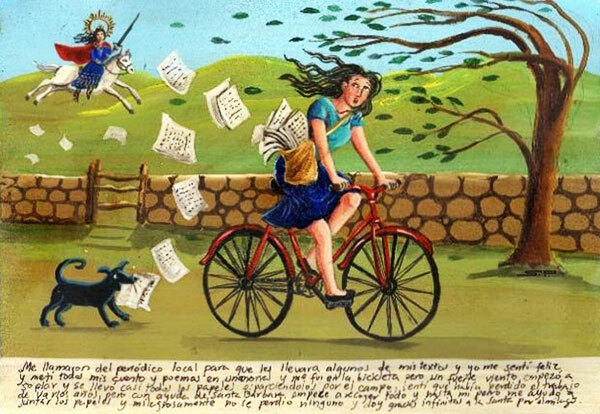 I took all my stories and poems and went to the town on my bike. But on my way there a strong wind blew in my face, and all my papers flew away. I felt like the work of few years of my life had gone. But with help of Saint Barbara I was able to pick up everything, and even my doggy helped me. It was a real miracle that I didn’t lose not one list. I thank the saint.